Yesterday morning I woke up early with an appetite for pancakes and bacon. Before dawn I drove west on Route 302, through Crawford Notch, and up the Zealand Rd. It was cold and I used the heater in my truck for the first time since April. As I started up the trail to Zealand Falls I could see my breath. The maples on the streambanks could feel the fall coming too. Many were already dropping red leaves into the cold water. As I made my way up the Zealand Valley the sky got brighter, and I stopped along the first pond to wait for the sun. What used to be large log yards for J.E. Henry’s timber have become marshes full of tamarack, beaver and moose. I was almost to the hut, and thinking about pancakes and bacon again when I heard a large branch snap. I stopped on one foot and listened. From behind a screen of birch saplings on my left I heard a loud snort, and the suction sound of hooves coming out of mud. A moose. More snorts came, a few grunts, and it sounded as though he was moving off into the beaver bog. Suddenly the saplings 10 feet to my left parted as a giant bull moose came charging through them. He was grunting, snorting, and winking at me, puffs of steam coming from his huge cartilaginous snout. He was sassy and amorous. An artist’s rendering, drawn to scale, is included on the right. Fortunately I have long experience with this sort of thing. As a 7th-grader who was slow to grow, I often faced similar situations at junior high dances when much larger girls came after me. I attribute much of my success as a middle-distance runner to those evasive sprints. Similarly, when I worked at Zealand 3 falls ago I faced an identical situation with an even larger moose. I am not sure if my beard and lack of antlers gives the impression of a shapely female moose, or if these bulls think I am winking at their girlfriend across the bog. Either way, the result has been the same: me running full speed down the Zealand Trail with a grunting moose trotting behind. In both cases the moose have given up the chase after a relatively short distance. Which is fortunate. If they wanted to catch me, they could. 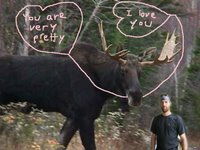 Moose can run up to 35 m.p.h., and I have seen it stated that moose kill more people in Alaska than bears, using their front legs and hooves like pile drivers. I have also read on Wikipedia that the Swedish Army tried to make a moose cavalry in the late 1600's. However, they discontinued the effort after realizing that if criminals stole these hot-rod moose they would be able to outrun police on horses. Which confirms my suspicion that online research may not be as reliable as the library variety. Selena Humphreys, the naturalist at Zealand, has startling, but less outlandish information on moose. During her evening program at Zealand she described how moose gain 600 pounds in their first year of life. And she confirmed my observation that bull moose lose their senses during the fall rut. Years ago a bull moose charged head-on into the front of a locamotive in Crawford Notch, derailing the train. During the fall the bulls do not eat, and to attract females they scrape a hole in the ground, urinate in it, then roll around in the resulting mud. 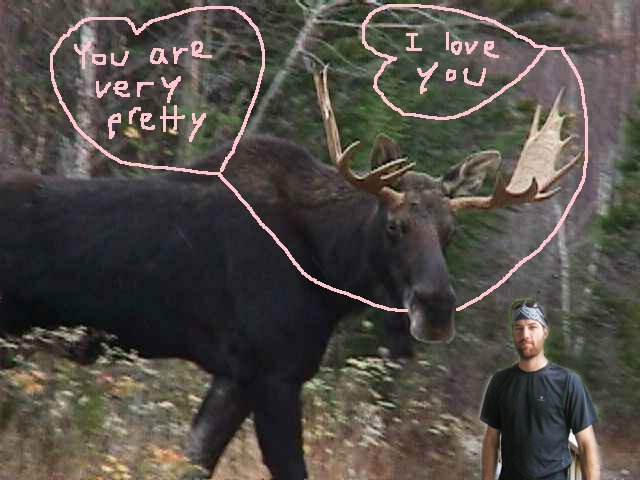 Moose in love are as irrational as any other lovestruck mammal. Ultimately, the moose I encountered was more interested in that pursuit than fighting. I arrived at Zealand out of breath and full of adrenaline. 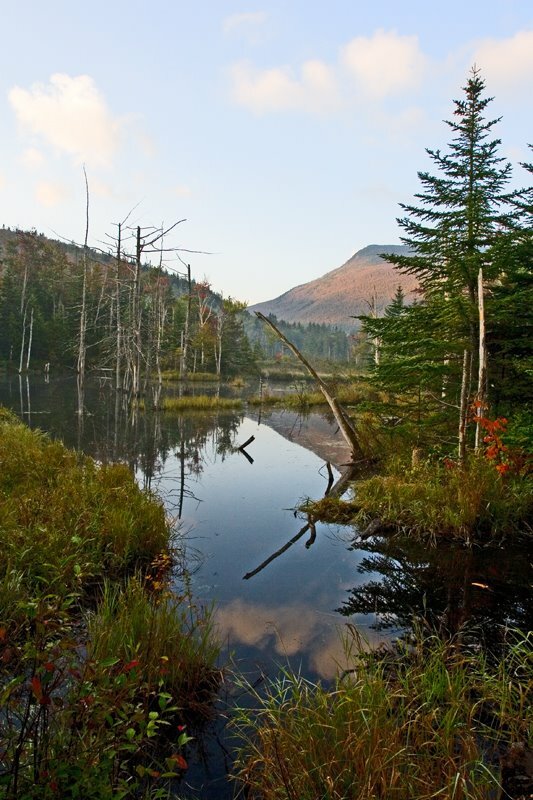 The rutting season continues into October, so keep an eye out as you hike the lowland trails. It is hard to tell what might strike a moose's fancy this time of year.